Research from Oxford University has determined that organic farms support at least 50% more species of pollinators and 34% more species in general. Dear WIC: Why aren’t organics allowed for poor pregnant women and babies? Despite rampant evidence that GMOs and pesticides are incredibly harmful, particularly for those the WIC program purports to be "nourishing", in most cases organic choices are strictly not allowed. Organic milk is not just about fewer pesticides, hormones and antibiotics. New research confirms that organic milk has significantly more and better fats. Organic milk fats are compared with fish. Can Organic Bananas Prevent the Demise of the Banana from TR4? Bananas now face a world-wide devastation from the TR4 fungus Fusarium oxysporum. Can organic cultivation practices provide the solution before its too late? Let's face it, we're all trying to cut corners here and there to make our monthly budgets work for us, without having to sacrifice nutrition or flavor. Purchasing all organic foods can come with a hefty price tag, if you don't know how to do it. How Does Antibiotic Resistant Bacteria Wind Up in Organic Meat? The future is local. The future is organic. Well, at least it could be if we base our food production on an increasing body of evidence that indicates the harmful effects of petrochemical, corporate-controlled agriculture. In June, researchers at the University of Canterbury in New Zealand concluded that the GM strategy used in North American staple crop production is limiting yields and increasing pesticide use compared to non-GM farming in Western Europe. Led by Professor Jack Heinemann, the study’s findings were published in the International Journal of Agricultural Sustainability. The study finds that Europe is decreasing chemical herbicide use and achieving even larger declines in insecticide use without sacrificing yield gains, while chemical herbicide use in the US has increased with GM seed. In effect, Europe has learned to grow more food per hectare and use fewer chemicals in the process. The US choices in biotechnology are causing it to fall behind Europe in productivity and sustainability. The decrease in annual variation in yield in the US suggests that Europe has a superior combination of seed and crop management technology and is better suited to withstand weather variations. This is important because annual variations cause price speculations that can drive hundreds of millions of people into food poverty. 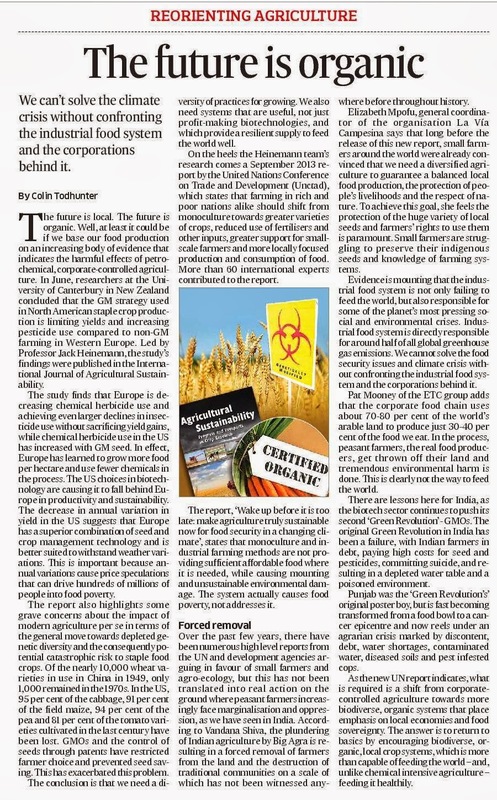 The report also highlights some grave concerns about the impact of modern agriculture per se in terms of the general move towards depleted genetic diversity and the consequently potential catastrophic risk to staple food crops. Of the nearly 10,000 wheat varieties in use in China in 1949, only 1,000 remained in the 1970s. In the US, 95% of the cabbage, 91% of the field maize, 94% of the pea and 81% of the tomato varieties cultivated in the last century have been lost. GMOs and the control of seeds through patents have restricted farmer choice and prevented seed saving. This has exacerbated this problem. The conclusion is that we need a diversity of practices for growing. We also need systems that are useful, not just profit-making biotechnologies, and which provide a resilient supply to feed the world well. On the heels the Heinemann team’s research comes a September 2013 report by the United Nations Conference on Trade and Development (UNCTAD), which states that farming in rich and poor nations alike should shift from monoculture towards greater varieties of crops, reduced use of fertilisers and other inputs, greater support for small-scale farmers and more locally focused production and consumption of food. More than 60 international experts contributed to the report. The report, ‘Wake up before it is too late: make agriculture truly sustainable now for food security in a changing climate’, states that monoculture and industrial farming methods are not providing sufficient affordable food where it is needed, while causing mounting and unsustainable environmental damage. The system actually causes food poverty, not addresses it. Over the past few years, there have been numerous high level reports from the UN and development agencies arguing in favour of small farmers and agro-ecology, but this has not been translated into real action on the ground where peasant farmers increasingly face marginalisation and oppression, as we have seen in India. According to Vandana Shiva, the plundering of Indian agriculture by Big Agra is resulting in a forced removal of farmers from the land and the destruction of traditional communities on a scale of which has not been witnessed anywhere before throughout history. Elizabeth Mpofu, general coordinator of the organization La Vía Campesina says that long before the release of this new report, small farmers around the world were already convinced that we need a diversified agriculture to guarantee a balanced local food production, the protection of people’s livelihoods and the respect of nature. To achieve this goal, she feels the protection of the huge variety of local seeds and farmers’ rights to use them is paramount. Small farmers are struggling to preserve their indigenous seeds and knowledge of farming systems. Evidence is mounting that the industrial food system is not only failing to feed the world, but also responsible for some of the planet’s most pressing social and environmental crises. Industrial food system is directly responsible for around half of all global greenhouse gas emissions. We cannot solve the climate crisis without confronting the industrial food system and the corporations behind it. Pat Mooney of the ETC group adds that the corporate food chain uses about 70-80% of the world’s arable land to produce just 30-40% of the food we eat. In the process, peasant farmers, the real food producers, get thrown off their land and tremendous environmental harm is done. This is clearly not the way to feed the world. There are lessons here for India, as the biotech sector continues to push its second ‘Green Revolution’ - GMOs. The original Green Revolution in India has been a failure, with Indian farmers in debt, paying high costs for seed and pesticides, committing suicide, and resulting in a depleted water table and a poisoned environment. Punjab was the ‘Green Revolution’s’ original poster boy, but is fast becoming transformed from a food bowl to a cancer epicentre and now reels under an agrarian crisis marked by discontent, debt, water shortages, contaminated water, diseased soils and pest infested cops. As the new UN report indicates, what is required is a shift from corporate-controlled agriculture towards more biodiverse, organic systems that place emphasis on local economies and food sovereignty. The answer is to return to basics by encouraging biodiverse, organic, local crop systems, which is more than capable of feeding the world – and, unlike chemical intensive agriculture – feeding it healthily. Prenatal exposure to persistent organic pollutants and rapid weight gain and overweight in infancy. Stooping to conquer … Already an overwhelmingly agrarian state, Bhutan is aiming to become the world's first completely organic country. (Photograph: Alamy) But rather than accept that this will mean farmers of the small Himalayan kingdom of 1.2 million people will be able to grow less food, the government expects them to be able to grow more – and to export increasing amounts of high quality niche foods to neighbouring India, China and other countries. The decision to go organic was both practical and philosophical, said Pema Gyamtsho, Bhutan's minister of agriculture and forests, in Delhi for the annual sustainable development conference last week. United Natural Foods Incorporated, the largest wholesale distributor of organic and “natural” foods in the US, is currently under investigation for 45 violations of federal labor law. Whole Foods Market (WFM) CEO John Mackey has done a brilliant job of creating the illusion that his empire is all about abundance, bounty and the good life. But there’s nothing bountiful or good about the way the second-largest non-unionized food retailer exploits workers. United Natural Foods Incorporated (UNFI), the largest multi-billion dollar wholesale distributor of organic and “natural” foods in the U.S., is currently under investigation for 45 violations of federal labor law, including physically threatening immigrant workers in California who were trying to form a union. The company recently fired its underpaid and overworked unionized workers at its Auburn, Wash., distribution center for going on strike, and illegally hired non-union replacement workers. What happens when companies like WFM and UNFI, which have carefully cultivated their public progressive images, start acting like Walmart? When union-busting and labor exploitation are accepted as “business-as-usual” in the green economy, it makes us all look bad. It discredits organics and Fair Trade by creating the impression that consumers don’t really care how their healthy organic food was produced. That the entire industry cares only about profits. Ethics and workers be damned. When flagship organic companies take a Walmart approach to workers’ rights, it sends negative and conflicting signals to core organic consumers, making it look like leaders in the organic community are concerned about the plight of endangered species and Third World coffee growers or cacao producers, but oblivious to the economic pain and stresses of working class Americans or hardworking immigrants who plant and harvest our organic fruits and vegetables and then pack and deliver them to our neighborhood co-ops and natural food markets. Isn’t it time we ask the same of WFM and UNFI that we demand of ourselves: that they walk their talk, prioritize organic food and products, practice Fair Trade and social justice, and wake up to the fact that "business as usual" is a bitter recipe for injustice? The demand for organic and fairly traded food, apparel and body care products has grown exponentially over the past two decades. Millions of consumers are demanding products that not only are organic and healthy, but also embody Fair Trade principles, whereby the workers involved in producing these products are treated fairly and paid equitably. Under the USDA’s National Organic Program (NOP), organic products are certified by third-party certifiers and regulated under federal law. But no such federal standards exist for Fair Trade labor practices, including the right of workers, especially in large businesses, to form trade unions and engage in collective bargaining with their employers. As a consequence many consumers look for the “Fair Trade” label on imported goods, but pay little attention to the domestic supply chain. Here in the U.S., most consumers naively believe that organics and Fair Trade practices go hand in hand. They are surprised to learn that most family farmers and farm workers, as well as many supply chain workers, struggle to make a living. But the truth is, labor exploitation is rampant in the fields, factories and warehouses where organic products are grown, processed and housed. And this is especially true when small, alternative businesses are bought out by corporate investors. WFM is one of the biggest offenders in the U.S. The company’s Whole Trade Guarantee, through a third-party verified program, supposedly ensures that producers and laborers in developing countries get an equitable price for their goods in a safe and healthy working environment. But here in the U.S., WFM. the second largest union-free food retailer behind Walmart, has taken the position that unions are not valid. The company even gives its workers a pamphlet titled "Beyond Unions." In the company’s 27-year history, only one of its stores, in Madison, Wis., successfully unionized. The chain has also fended off unionizing attempts in Berkeley, Calif.; St. Paul, Minn.; and Falls Church, Va.
As for UNFI, the company’s recent record on workers’ rights is abysmal. The National Labor Relations Board investigation includes allegations that UNFI engaged in worker surveillance, intimidation and retaliation; that it refused to bargain in good faith; and that it illegally reassigned bargaining unit work. UNFI workers and drivers at UNFI’s Auburn, Wash., distribution center went on strike for better pay and better working conditions Dec. 10, after rejecting UNFI’s latest contract offer. In retaliation UNFI fired them and illegally hired non-union replacement workers. WFM and UNFI like to brag about how their workers are part of their “family,” and how well management treats them. But what about the thousands of non-unionized and exploited farm workers in California, Texas, Florida, Mexico, Latin America and Asia who supply many of their premium-priced products? What about the immigrant feedlot workers across the country? What about the truck drivers, food processing workers and warehouse staff who are threatened and intimidated whenever they try to organize themselves for collective bargaining? Are we all one family? It’s time for WFM and UNFI to publicly acknowledge that Fair Trade principles and practices need to be implemented as part of their entire US/North American/global supply chain for food and organic and natural products, not just for the minority of products produced overseas and certified as Fair Trade. And of course, supporting domestic Fair Trade means that WFM and UNFI must stop their union busting and start recognizing the rights of workers, especially workers in large for-profit corporations, to freely organize themselves into unions for collective bargaining. Until they do, as conscientious consumers we have to pressure UNFI and its largest customer, WFM. In response to UNFI’s actions in Washington State, the Organic Consumers Association (OCA) has called for a boycott of UNFI’s brand name products, Woodstock Foods and Blue Marble, until the company rehires its fired workers in Auburn, stops harassing and intimidating workers and drivers who want to form a union, and sits down to sign a fair contract. We’re also asking organic food stores to look for alternative wholesalers to supply their stores, as a number of coops in Seattle and Olympia Washington, have already begun to do. Sign the online petition in support of the striking workers at UNFI. Call UNFI Manager Hank Heatherly at (253) 333-6769. Tell him to rehire the fired workers and return to the bargaining table immediately. If you live in Washington State, and are willing to join in informational leafleting at Whole Foods Markets, sign up here. Does Organic Really Mean Organic? Do You Suffer From a Burning Stomach? Prison Planet.com » Is Social Media Destroying Humanity On Purpose? Greenpeace: Has its crusade to save the world descended into hypocrisy & misinformation? How Would You Even Begin To Prep for It? Who Wants a Kinder, Gentler Pepe? Make America Great, Like It Was – When? Buckraking on the Food Beat: When Is It a Conflict of Interest?